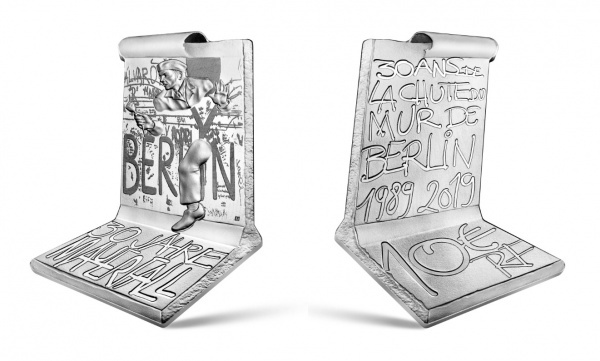 The Monnaie de Paris has launched new collector coins produced in gold and silver which are in tribute to one of the 20th century’s most important events, the day the Berlin Wall came down. With the closing days of communism, that was collapsing in Eastern Europe, the Berlin Wall, erected by the East German government at the behest of Soviet authorities, sought to essentially wall-in the Berliners living in the western half of the city. Under the administration of the United States, the United Kingdom, and France, the western half of the former capital of Germany had been divided from the fourth sector of the city administered by the Soviet Union. This scenario was mirrored with the whole of Germany, which surrendered to the Allied forces in May 1945, after the suicide of Adolph Hitler. Since Berlin was located in the portion of Germany under Soviet authority, later known as the German (Deutsche) Democratic Republic (DDR), many Berliners rushed to move into the sectors of the city administered by the Western Allied powers. Soviet authorities hoped that the western allies would relinquish administration of the remaining sectors of Berlin to them. In an effort to push them into this move, a blockade to stop the movement of food and medicine was put into force in June 1948, leaving West Berliners without the necessary requisites to live, including electricity. An airlift to provide West Berliners was organised by the three allied powers, known as the “Berlin Airlift,” which proved that more than 4,500 tonnes of supplies could be moved in the short space of just two months. By spring 1949, the Berlin Airlift proved successful and the Western Allies showed that they could sustain the operation indefinitely. At the same time, the Allied counter-blockade on Eastern Germany was causing severe shortages, which, Moscow feared, might lead to political upheaval. From noon on the 15th April to noon on the 16th April 1949, crews worked around the clock. When it was over, a massive 12,941 tonnes of coal had been delivered in 1,383 flights, without a single accident. The determination of the West intimidated the Soviets to the degree that on the 15th April 1949, the Soviet news agency TASS reported a willingness by the Soviets to lift the blockade. Tensions were not wholly alleviated as the continued exodus of East Berliners leaving the eastern half of the city did not end. East Germany, under the authority of Soviet advisors, planned a wall which would enclose in the western half of Berlin. In what was initially a hastily completed structure, a concrete barrier had encircled West Berlin in August 1961, complete with guard towers and barbed wire. The wall proved to be the obstacle communist authorities hoped it would be, as it prevented almost all such movement to the west. From the time of its construction to its downfall, over 100,000 people attempted to escape, and it is believed that just over 5,000 people succeeded in escaping over the wall. It is also estimated that the death toll ranged from 136 to more than 200, not just between the two halves of Berlin, but all around the wall into East Germany. The final push to tear down the Berlin Wall came in 1989, as profound changes were taking place in the USSR and a series of revolutions in nearby Eastern Bloc countries. Poland and Hungary, in particular, caused a chain reaction in East Germany that ultimately resulted in the wall’s demise. On the night of the 9th November 1989, it was announced that all DDR citizens could visit West Germany and West Berlin. Crowds of East Germans crossed and climbed onto the wall, joined by West Germans on the other side in a celebratory atmosphere, some with pickaxes and sledgehammers, who took it upon themselves to break open a pathway in sight of the Brandenburg Gate. This move was televised around the world to a stunned audience and it would pave the way for an ultimate German unification of West and East Germany under one federal government less than a year later. 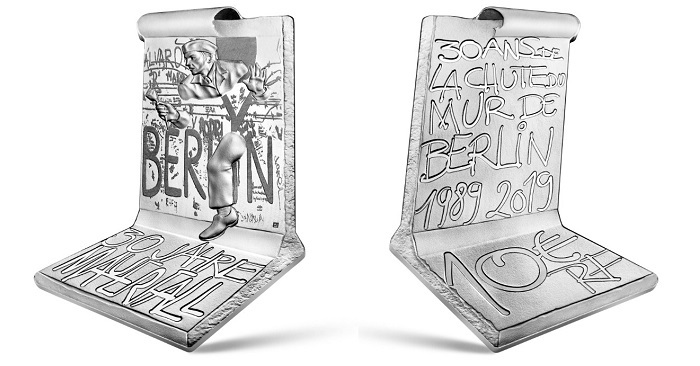 The reverse displays a design including the text 30 ANS DE LA CHUTE DU MUR DE BERLIN 1989-2019, shown in a similar handwritten style honouring this major event. The face value and the initials RF also appear. 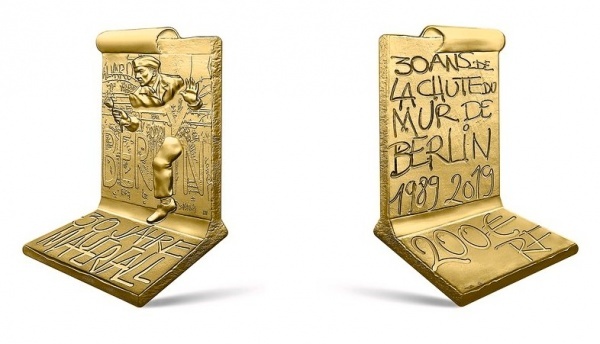 The coins are encapsulated specifically to accommodate their unusual shape and are presented in a custom MDP case, accompanied by a certificate of authenticity. For additional information about these coins and others available from the Monnaie de Paris, please visit their website.